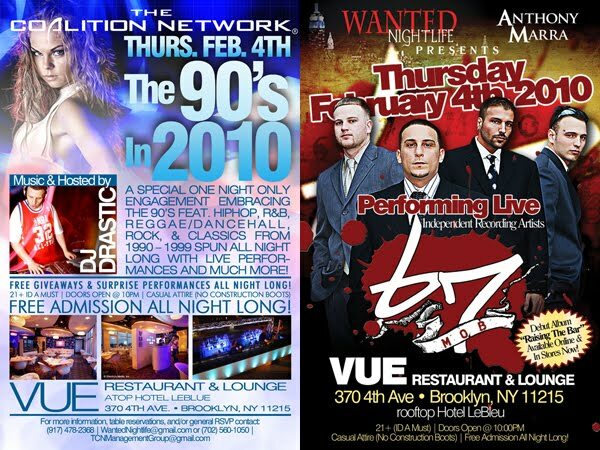 02.04.10 (One Night Only) World-Renowned, Untouchable DJ Drastic Live @ The Vue | Hotel Le Bleu (Rooftop) & Live Performance(s)! Join some of the most elegant socialites in New York for Brooklyn’s only heated-rooftop engagement at the luxurious five-star, Hotel Le Bleu. Hotel Le Bleu is located in the heart of Park Slope, Brooklyn. Just minutes away from New York City, The Vue at Hotel Le Bleu offers a magnificent glass décor and outdoor smoking area with numerous television screens broadcasting sports and more. Top shelf bar open all night long. The Vue at Hotel Le Bleu is easily accessible by bus, train, or car with an outdoor parking lot. It is the stylish haven of an iconic borough. A special one night only engagement embracing the 90s featuring Hip Hop, R&B, Reggae/Dancehall, Rock, & Classics from 1990 – 1999 spun all night long with live performances and much more. Debut Album, “Raising The Bar” Available Online & In Stores Now! Free Giveaways & Surprise Performances All Night Long! Free Admission All Night Long!